A super idea for using plastic shopping bags and sellotape to make sculptures which spring to life as they inflate when you attach them to a fan. You might use different coloured bags and draw on them with sharpies and experiment with fan speeds. 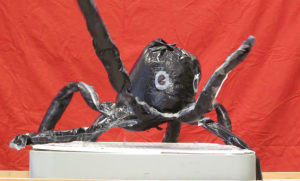 Find detailed instructions for an inflatable sculpture project on Amy Schleser’s blog. together with some inspiring examples, lesson plans and assessment ideas.